You call this a tale of romance? I broke up with my first lover over the phone and while watching TV. I’m not proud of this. Still, that’s an indication right there, wouldn’t you say? that we – Lili and I – had prolonged things beyond their natural life? That we were no longer synchronized? We had begun matters, how many years before? three? two? delighted with each other’s odd impulses and reactions and confidences and curious humors. Now a phone call on an idle night had become a source of conflict. You see, this was back before VCRs were common, so when public television announced a showing of The Tristan and Isolde Storyin a rare, uncut print, I had to watch. I lowered the lights, set out a pad for taking notes and poured a glass of beer. The movie had barely begun when the phone rang. I always had the phone attached to the wall whenever I moved into a new apartment, so that no matter how cluttered the place got I could always find the phone, and I always made sure it had a very long cord, so I could do other things while talking on the phone. On this particular night, as I drew the cord into the living room so I could keep an eye on the screen, I found I’d already missed the movie’s credits. I only saw, out of the corner of my eye, that the dances were by Hermes Pan. “I wish we could discuss this in person,” I said. “I think it’s important that we get everything clear.” I tried to sound noble, concerned about us, but I hated to be missing the movie. Of course I didn’t say that. Later, it was too late to say it. We’d always been able to discuss our attraction to others, confide our seductive stratagems, console, in whatever fashion, disappointments. We thought this very adult, like a French novel, but it was really a safety measure. It spared us the responsibility of being the sole object of the other’s need. I was not sure I was as much in love as Lili was, or as I ought to be, or what exactly I did feel other than lustful but terrified – of hurting her, of being hurt myself. The whole thing worked pretty well for some time because we were both more involved in our heads than in our bodies. Until the matter of Linda and Phil. “This has nothing to do with Linda,” I said, hoping Lili would talk enough for two and not expect me to sift her too carefully. Meanwhile, on the screen, a vast, classy ocean liner appeared, close-up on the name, “S.S. Dumnonia,” dissolve to the boyish face of a sailor (Carleton Carpenter? perhaps), who began to keen a vaguely nautical air. Do they send us whirling? Sweet Irish gal – my winsome, wild Irish gal! The tune, a cappella to begin with, slowly acquired strings, horns, pounding drums, until the rhythm, from slow and folksy, segued into a smoky blues with the theme, double time, now in the relative major. Dazzling, just to keep track of it all: the energy! the kitsch! 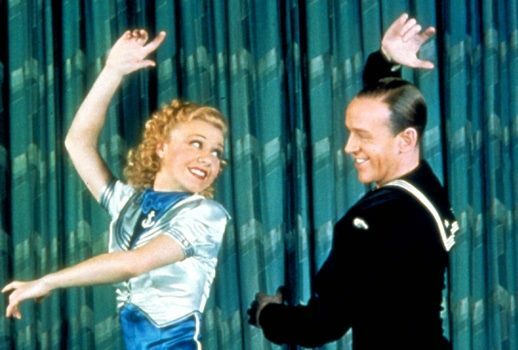 and the coincidence of images, as the sailors shuffling on deck became, ever so gradually, groups of dancers, hornpiping with a hint of hep, until, at a breathless pause, rows parted for a dapper figure in dress whites, captain’s cap at a rakish skew – Fred Astaire, of course. He swashed about the deck, partnering nautical motif upon nautical motif in apparent serendipity: up gunwhales, down gangways, tiptoeing from funnel to funnel, comically upset by the simulated rolling of the ship – this was all filmed on a soundstage on dry land, of course – recovering himself at the last and turning his lost footing to exquisite account. Cinematic whipped cream. “Brangaene, Tristan – is– that dance instructor!” Double-takes all round. Helen – or was it Joan? – was on deck now, swapping epithets with Tristan’s valet, Kurvenal (Eric Blore, of the Brit slow burn), and I couldn’t hear a word of the exchange, with Lili rambling. “Couldn’t you turn down the TV?” she said. “Why don’t you come over?” I wheedled, thinking her travel time would get me a free hour or so, and none of these thirties musicals last very long, unless interrupted by a PBS pledge drive. “Are you there?” A tinny voice from across the room. “There isn’t enough away for most of it to be put.” About me, books, recordings, uncompleted manuscripts nodded in agreement in the breeze. I tried to reason with Lili – a handful, rather. She didn’t seem to like that, actually. Debonair, he strikes up a few flirtatious jokes with his invisible companion, and is so engrossed in laughing at them with her that he doesn’t notice Joan (Helen?) has appeared by his side, studying him with the detachment of a psychiatric nurse. But it was no time for dialectic: Fred and Ginger were singing a comic duet of recrimination (who wrote these lyrics? Otto Harbach? Irving Berlin?) while Brangaene, in the galley, intending to stir up a toddy against seasickness, accidentally overspikes the cocktails. You call this a tale of true love? Provide them so little material? But no one could call it romance. I forget what she said, but we became quite heated. By the time I remembered the movie, the drinks were drunk, the veil was rent, everyone was on shore, and a starlet (pre-pin-up Betty Grable? – apparently) was introducing the new dance craze, “Minne the Macher,” which led to a spectacular sequence. Cornish nymphs with crimped curls and weirdly unblinking eyes spun, in silver and ebony gowns, across a soundstage lit to represent the moonlit seaside gardens of Isolde’s new hubby, millionaire Mark King (Edward Everett Horton of the beetling brows). Front and center, among the spiraling gownery, Fred and Ginger created, jazz posture upon jazz posture, epigrammatic visual metaphors for the couplings of lovers (Save that phrase!). Meanwhile, Melot (Franklin Pangborn), Tristan’s “pal,” sought fruitlessly to betray them to double-taking Horton, himself busily demonstrating (to Joan and Eric, feigning fascinated interest) the superiority of a Tintagel egg beater to the product of a rival firm. Those attachments! Those ingenious extensions! Ten thousand zaftig chorines swirled up a vast white conch of a staircase leading the eye, with many a replicate, satiny kickstep, from the reality of the garden to the inner sanctum of the lovers’ linked subconscious where, in new, shimmering costumes, all rhinestone and bugle bead, backlit in risqué silhouette, the pair tapped and swiveled to represent the chaotic ungravity of emotional turbulence (this article will write itself! ), until, in a brief, shocking camera trick, he appeared to have her preening arms and voluble calves, sheseemed to have sprouted his pumps and top hat. “I have my doubts,” Lili said. Interrupted – by a sudden outrageous squeal in the key of Blondell. The drums were gone, and so was the star-encrusted night. In cruel daylight, Franklin and Eric and Edward Everett (his hand still trapped in an egg beater) confronted Ginger and Fred. Waves lapped the beach and dulcet oboes tugged at our hearts. “I’ll come too,” I said, falsely hearty. “We can talk it all through during the intermission. There’s nothing like sharing good music to alter moods, unify emotions.” I was light of heart, for I knew this to be true. Sometimes. “Well, I don’t agree with that at all. But call me after you get home from the concert. I’ll be up.” I said this cheerfully, to reassure her that I wasn’t seething or anything, that I thought her date innocuous, not intended to lead to – anything I might want her to interrupt, the way good music had always led to such places for the two of us. “I think it’s your failure to focus,” said Lili, and for a moment I thought she was referring to the set, which was indeed a blur. That turned out to be intentional, as the dream sequence got under way: Tristan in his delirium seeing five hundred Isoldes, with identical gowns, coiffures, ironic smiles, as they sashayed to the crooning melody in spirals that mimicked (you realized, when the change in camera angle was complete) the Celtic knotwork in the harp by his sickbed. Fred-Tristan, alone, mimed the animals in the Book of Kells, yet remained adorably Deco somehow, as he clutched at sinister hallucinations of Ginger-Isolde, partnering pillars of smoke and shade, while lascivious saxes depicted, ever more graphically, his yearning. She was moved – I could hear it in her breathing. “Well I guess it’s better to know than not know,” she said, flatly, letting me hear the beginning of tears before she hung up, so that I’d feel a proper cad. I did. Brangaene had been Alice Brady all the time!